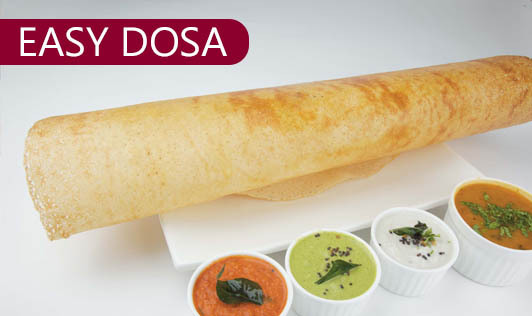 The minute a person hears ‘South-Indian cuisine’, Dosas and idilis are the first names that come to one’s mind. It is a perfect cereal-pulse combination and a perfect breakfast or a snack option for your family. Soak the rice separately in enough water for 3 hours and drain. Soak the urad dal, fenugreek seeds and beaten rice together in enough water for 3 hours and drain. Blend the urad dal, fenugreek seeds and rice flakes together in a mixer till smooth and frothy ( add water little by little as required ). Remove and keep aside. Combine the urad dal paste and rice paste together in a bowl and cover and keep aside to ferment for at least 3 to 4 hours. Once the batter is fermented, add the sugar and salt to the batter and mix well. Heat a non-stick pan and sprinkle a little water on it. It should steam immediately. Grease it with oil and wipe hard with a slice of onion or potato. Pour a ladleful of the batter on the tava and spread in a circular motion to make 5" thin dosa. Smear a little oil along the sides, cook till the dosa turns brown and crispy and fold over to make a semi-circle. Repeat with the remaining batter to make 7 more dosas. Serve with chutney and hot sambhar.